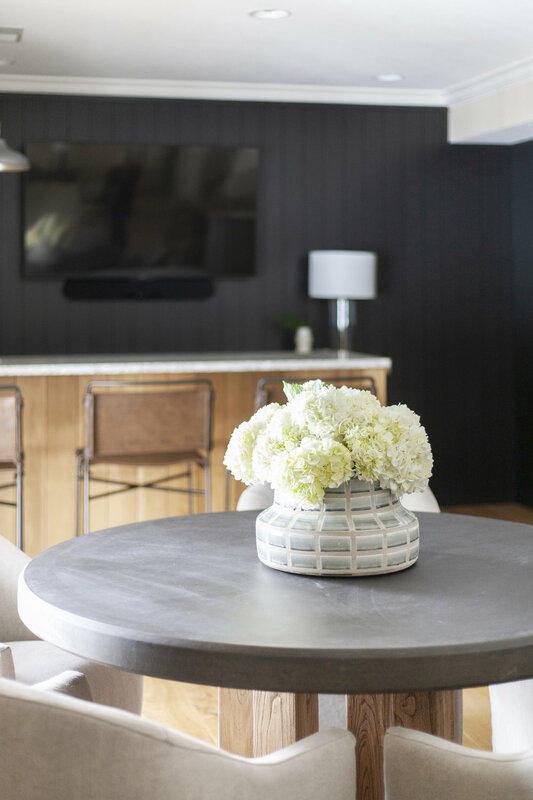 In our latest home reveal, we helped our clients keep work separate from play with a sleek, sophisticated office and a basement lounge that is perfect for those friends and family get togethers. This transitional home can be defined by one of our favorite phrases: work hard, play hard. Having an exclusive space to work from home is so important. It keeps you from working in the living room (where you should be enjoying family time) or even worse, your bedroom (where you should be catching some zzz’s). The increased productivity and a place to organize all your files doesn’t hurt either. Our clients wanted an office that was rich in tone and details. 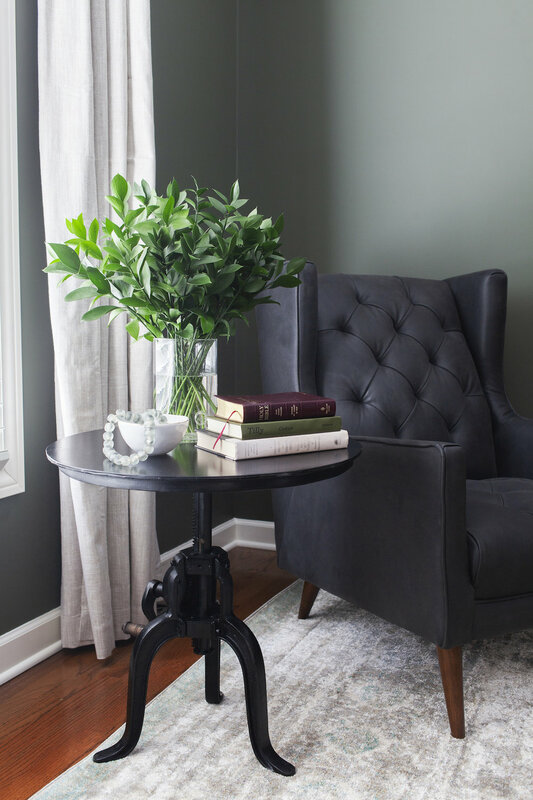 Their ideal canvas started with Sharkskin by Benjamin Moore and a studious desk they already had in the home. We believe that your best work happens when you are comfortable, and we can say without a doubt that the Wyatt Home Office Chair is your ticket to a comfortable work experience. This adjustable rolling chair’s modern body style and classic leather upholstering is bold but not imposing, chic but not pretentious, and still offers a sense of ease to soothe any potentially stressful work environment. Tucked away in a corner by the window is the Barry Chair, perfect for guests or quiet moments with a cup of coffee and a good book. 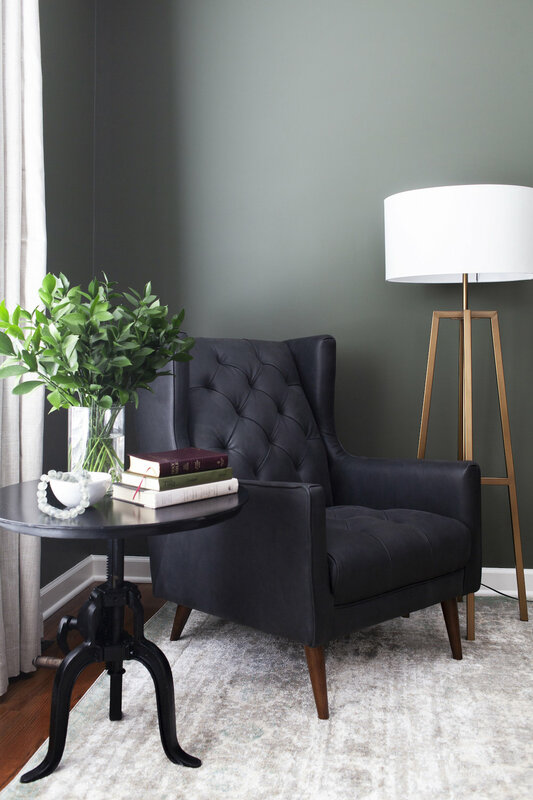 Whether reading by the natural light of the window or the soft light provided by the Lewis Floor Lamp, this is definitely the place you want to find yourself on a rainy spring day. No office is complete without bookshelves, and the openness of the Johnson Bookcases were the perfect touch for this efficient space. The tall shelves provide space to display family photos, art, and, of course, favorite books. We love using baskets as open storage on bookshelves because it helps to style extra space while hiding away items like magazines or desk accessories that you might not want to put on display. The room is tied together by the Anastasia Rug in Grey Sage. This vintage-inspired beauty works in so many spaces and helps to bring a traditional touch to this transitionally designed room. Did we mention the Anastasia Rug comes in over 20 different colors and sizes? This softly patterned rug will fit in any space, making it one of our favorites! With such a stunning space meant for working hard, how could our clients not want a dedicated room for playing hard? 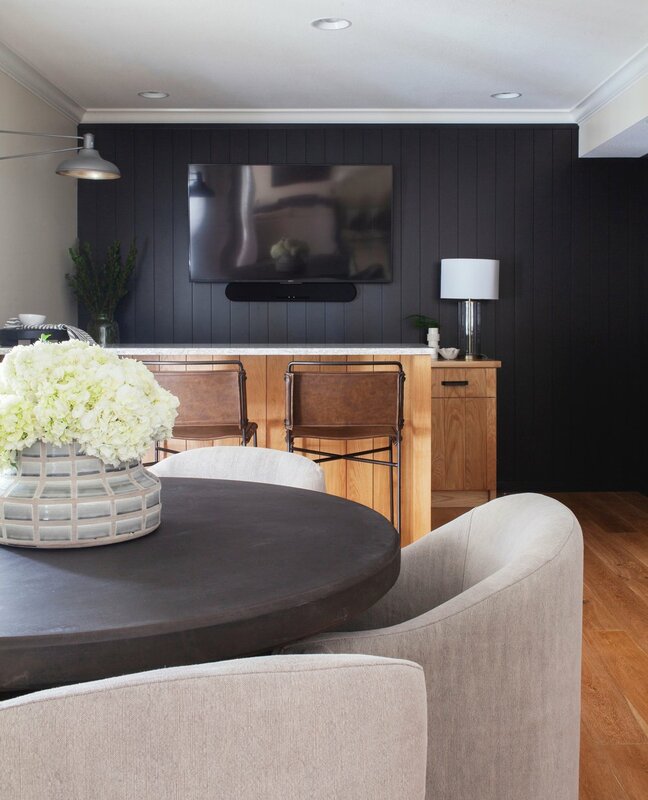 Let us introduce you to the epitome of “bar and lounge goals.” Tucked in the basement of the home, this multifaceted space features a wet bar, a round dining table perfect for game nights or potlucks, and a smaller seating area meant for those tête-a-têtes between friends. Whether gathering for the next big game, a feature movie showing or just spending time with your loved ones, this is the perfect space for entertaining. With a TV at the bar and another by the sofa, guests won’t miss a minute of the action. Whether they’re at the edge of their seat on the Wharton Bar/Counter Stools or lounging in the Cove Dining Chair, they’re sure to be comfortable. The bar isn’t short on shelving and storage. We’re particularly fond of the Millie Cabinet; the glass doors give guests a little peak of the goodies inside while the contrast of the black and natural woods helps the cabinet hold its own against the dark walls. Having designated spaces for work and play in a home can completely change how you live. When you have children, this can be especially important because they need these spaces just as much as the adults. By the way, we’re not done with this home! Keep an eye out for our next blog post about the children’s playroom/office. Get our next reveal sent right to your inbox by signing up for our e-mail list! High Point Market has come and gone and we are feeling so inspired by all the amazing styles that will be available soon. Take a peek at Jesse’s favorite products before these styles are released. 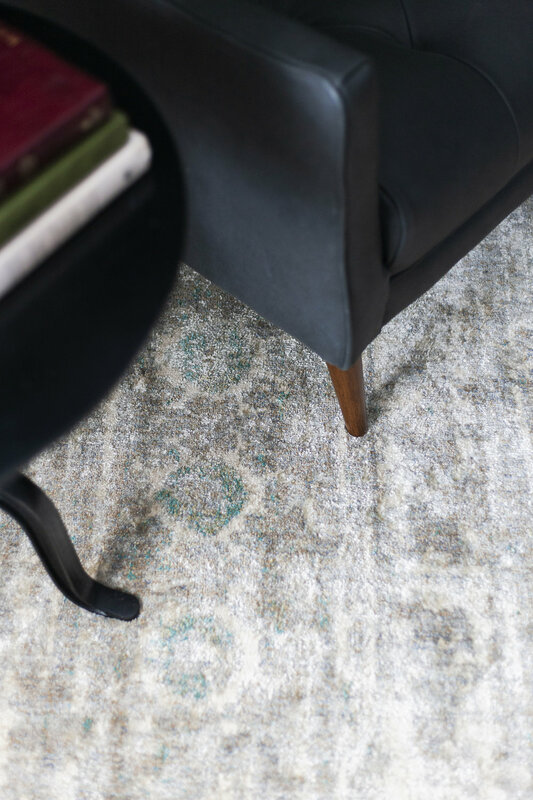 With unique patterns worn well in just the right places + top notch, durable quality that is sure to make an impression, vintage inspired rugs are the best of both worlds. Check out our vintage style rug round-up & awe-inspiring designer inspiration! A space that is specifically carved out for children doesn’t have to be all bright colors and plastic toys! See how we flipped this outdated office into a bright and modern kid friendly office & play room. Everyone needs a good balance of work & play. 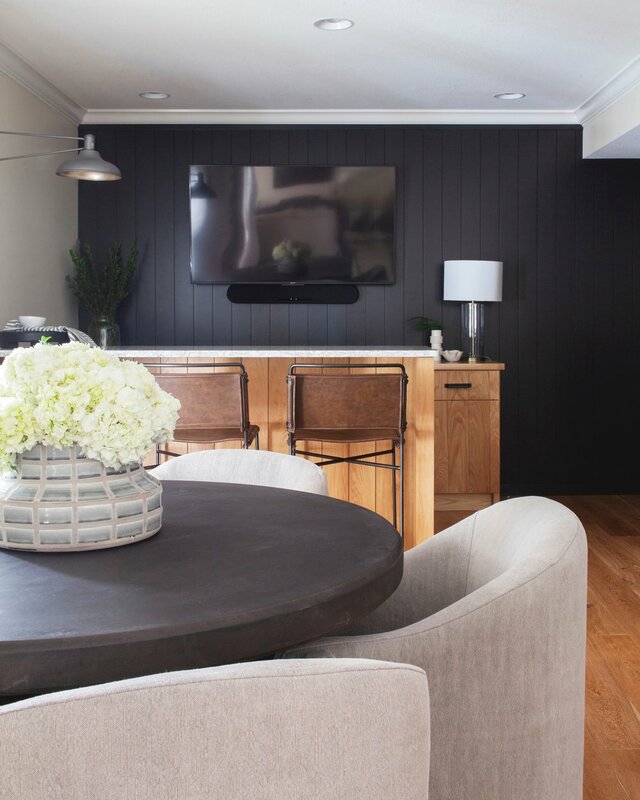 See how we updated this transitional home with a soulful, moody office & basement lounge perfect for family & friends. The wood formation that took the 70s by storm is back! With one-of-a-kind twisting patterns and unusual grains born from any type of tree species, this wild formation is a must for your home. Whether paired with a curated collection of other accent pillows or just showcased by itself, incorporating a lumbar pillow into your home is the cherry on top of any room design. We mixed modern elements with traditional pieces to bring our client’s transitional dream to life. See how in our latest home reveal: The Mixed Mod Project. Whether you’re a large art newbie or a seasoned veteran, our go-to guide will make incorporating large-scale art in your home a breeze. We can already tell that 2019 will be a beautiful year for design and we are so excited to introduce you to just a handful of our favorite new trends.